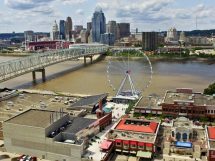 Louisville is world renowned for its food and drink scene, which is part of the reason that Lonely Planet named it the top U.S. travel destination of 2013. Pictured here is the Copper and Kings tasting room in Butchertown. It seems like a decade ago when Mayor Greg Fischer first uttered the term “Bourbonism” in relation to Louisville’s tourism strategy. But in just four years, his vision has come true, and then some. Angel’s Envy is open on East Main Street and going strong a year into public-facing production, adding another tourist attraction with its daily tours. 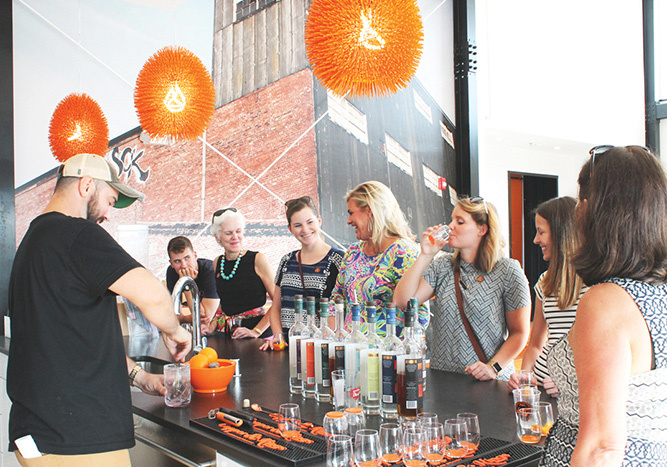 Rabbit Hole Distilling opened Derby weekend near NuLu, and Michter’s President Joe Magliocco said his bourbon operation’s new visitor center will overcome myriad structural issues and open on Whiskey Row later this year. Rabbit Hole founder Kaveh Zamanian believes the ever-growing number of distilleries and distillery attractions in Louisville has reached a critical mass so that Bourbonism can feed on itself, with each entity thriving off the others. Rabbit Hole distillery’s goal, he said, is to showcase the science of American whiskey, particularly bourbon, in a facility that utilizes an elevated visitor viewing platform to allow them to look down on the entire operation. Zamazian said Rabbit Hole conservatively predicts up to 30,000 visitors in its first year, adding to Louisville’s 24 million tourist visits each year, which impacts the economy to the tune of $1.32 billion and supports 26,000 tourism-related jobs. According to the Louisville Convention and Visitors Bureau, hotel rooms are opening at a rapid rate along with the tourism growth, with the recent openings of the Omni, Aloft, Embassy Suites and Homewood Suites by Hilton on West Market. A $30 million renovation to the Louisville Marriott Downtown will include a new restaurant. More than 2,000 new hotel rooms have opened in the last three years, the bureau reports. Meanwhile, Louisville’s brewing industry has grown along with its bourbon counterpart, adding another tourist draw to the city’s already vibrant setting, which includes a nationally recognized culinary scene. Gravely Brewing added a music-themed destination brewery, overlooking a pair of former beer tunnels that harken to Louisville’s rich brewing legacy. One of the city’s heritage beer brands, Falls City, was reborn in 2010 and in March opened a new brewery and taproom in the Phoenix Hill neighborhood. At the opening ceremony, Fischer noted that Louisville was “one of the great brewing cities in the 1800s,” adding to a spirits legacy that runs concurrent to “bourbonism.” He points out that this tourist aspect of Louisville isn’t manufactured – it’s part of the city’s very culture and history. More projects are in the planning that will further move the needle around Louisville, too. For instance, vodka maker Stoli over the winter unveiled Kentucky Owl Park in Bardstown, which will include a distillery, visitors center, restaurant, convention center and more. Bulleit Distilling is planning a $10 million, 9,000-s.f. visitor center at its distillery in nearby Shelby County, and the Bardstown Bourbon Co. by July will complete an expansion in Nelson County that will make it one of the largest bourbon distilleries in the world. Moreover, the recent passage of HB 400 means distilleries soon will be able to ship bottles of their products. Much like a winery in tourist-destination Napa Valley, when a visitor comes to a distillery from out of state, he or she can purchase bottles and have them shipped. The Kentucky Distillers’ Association estimates 70 percent of visits to Kentucky Bourbon Trail distilleries are from out of town, and more than 85 percent of those visitors purchase a bottle during their visit – further proof that bourbon, thanks in large part to efforts in Greater Louisville, is just getting started.